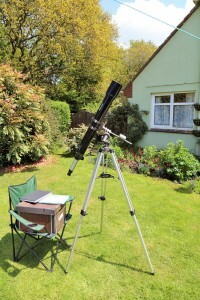 To maximise observing time, especially in late spring and summer, I’ve decided to have a go at solar observing and, at the moment, it seems to be all the rage with dedicated solar telescopes available for reasonable cost. I intend to buy a Hydrogen Alpha telescope at some point soon and I have my eye on a Lunt or Coronado 60mm. 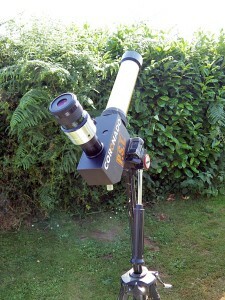 At the start, I used my 90mm refractor with some old eyepieces and projected the Sun onto paper, but from 3rd June 2013 I’ve had the use of a Coronado PST, loaned to me by a fellow member of Vectis AS, John Langley – thanks John. You can find the observations by clicking the link below. NB – You can’t be too careful when observing the Sun, because of the risk of damage to your eyes, and projecting it onto paper with a small telescope or a larger one with the aperture stopped down, or using a dedicated solar filter or solar telescope is the ONLY safe way to observe it. Never look at the Sun with anything other than a specialised solar telescope or filters or project it onto paper. While lining the scope up in the Sun, if it is a conventional telescope using the projection method, don’t be tempted to look through the finder or the eyepiece. Keep the finder scope capped or take it off, and line up the scope by looking at its shadow; when the shadow is smallest, everything is lined up. Solar scopes have special finders so there is no need to look at the Sun to find it.